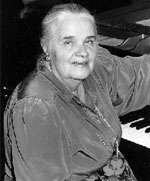 The distinguished Soviet pianist Tatiana Nikolayeva is a name familiar to many as one of the greatest forces behind the wealth of piano talent to flood from the former Soviet Union during the twentieth century. She was born on 4 May 1924 and began playing the piano at the age of three, subsequently entering the Moscow Conservatoire to study with Alexander Goldenweiser and Yevgeny Golubev. She retained her close connection with the Moscow Conservatoire all her life. Indeed, her name was inscribed twice on the marble Roll of Honour there, first as a pianist, then as a composer. After winning the 1950 Bach Leipzig Piano Competition, Nikolayeva built up a phenomenal volume of repertoire, ranging from Bach to Bartók and beyond. Her interpretation of Bach on record won great critical acclaim. Whilst others used so-called 'original' instruments, Nikolayeva preferred to play Bach on a modern Steinway—always with great success. Her long working association with Shostakovich, and her great understanding of all aspects of his music, made her one of the leading sources of contemporary knowledge about that great composer. 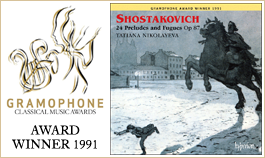 It was Nikolayeva for whom Shostakovich wrote his 24 Preludes and Fugues, inspired by hearing her Bach-playing at the 1950 Bach bicentenary Competition in Leipzig (he was on the jury), and it was she who premiered them in Leningrad in 1952. Tatiana Nikolayeva died on 22 November 1993.